Discover the incredible story of the Creature’s evolution, and become directly part of the history with interactive elements that allow readers to explore replica memorabilia, such pages from Mary Shelley’s original manuscript of Frankenstein. Once a book thought questionable by many, Frankenstein managed to make its way to the top as one of few respected books in pop culture. The original novel, a beautiful take on societal flaw and wonder, is now re imagined as a more interactive, colorful, and descriptive tool for all to appreciate. As we celebrate the 200th anniversary of Mary Shelley’s publication of Frankenstein, readers can dive right into the rich history of the story’s origins and greatest pop culture moments. 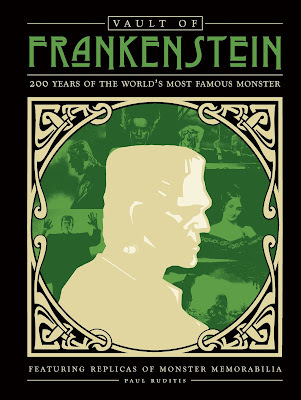 The experience is illustrated in the new book Vault of Frankenstien, 200 Years of the World’s Most Famous Monster (becker & mayer! September 25, 2018). Readers can trace the incredible history of how a disturbed creature, disgraced by his own creator, became an iconic symbol in pop culture. The book takes readers on a journey from the very beginning; starting with Mary Shelley’s creation of the novel, and then fluently guiding them through the Creature’s evolution to international stardom. As the Creature appeared in films, TV shows, comic books, and commercial merchandise, this new book introduces readers to the many aspects of such a beloved and tragically misunderstood character. Vault of Frankenstein is not only a loving tribute; it’s a great resource for anyone who appreciates a timeless classic. In fact, with fantastic replica memorabilia enclosed in an elegantly designed envelope inside the back cover, readers can enjoy physical works that bring the story even more to life. Readers will be able to hold in their handsThe Bride of Frankenstein movie poster, pages from Mary Shelley’s original manuscript of Frankenstein (or The Modern Prometheus), a photo of Boris Karloff on the set of Universal’s Frankenstein (a playbill for Presumption, orThe Fate of Frankenstein which is the first stage adaptation of Frankenstein) and finally, a Frankenstein movie poster. Together these pieces take readers through Mary Shelley’s first thoughts on an original masterpiece all while illustrating how an idea so small has become so influential through years of exposure. Finely stated, Vault of Frankenstein is not only a must-have for fans, but also a wonderful tool for anyone interested in the story’s rise to stardom and how it manages to influence culture today. The book brings history to life for readers who reflect on how such an enduring and influential character made its way through years of pop culture exposure. With key features such as a look on how Mary Shelley first conceived the work and 5-10 pieces of replica memorabilia, readers become a part of this important journey from historical masterpiece to pop culture icon. Paul Ruditis is a New York Times best-selling author and pop culture addict who has written companion books for TV shows, including The Walking Dead, Buffy the Vampire Slayer, Charmed, Star Trek, and The West Wing. His diverse resume also includes original young adult novels, comic books, and novelty books for all ages.